Photographer Jay Maisel bought 190 Bowery, the 35,000-square-foot building on the corner of Spring Street, for $102,000 in 1966. 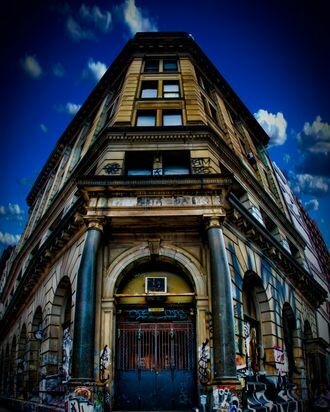 Originally built as a Germania Bank branch in 1898, and designated a city landmark in 2005, the place has weathered the Varvatos-ifcation of the Bowery as Maisel’s single-family home for decades. But it, too, may soon become commercial space. The limestone building is 6 stories, with a basement and roof terrace. Floors measure approximately 6,260 SF each and have 11-foot ceiling heights. The ground and second floors have 18-foot ceiling heights and are ideal for retail use. “RFR declined to comment and the photographer, Jay Maisel, did not respond to multiple requests for comment on the fate of the ornate six-story, granite and brick building,” Crain’s reports, which is in line with the family’s dedication to privacy over the years. The building at 190 Bowery is a mystery: a graffiti-covered Gilded Age relic, with a beat-up wooden door that looks like it hasn’t been opened since La Guardia was mayor. A few years ago, that described a lot of the neighborhood, but with the Bowery Hotel and the New Museum, the Rogan and John Varvatos boutiques, 190 is now an anomaly, not the norm. Why isn’t some developer turning it into luxury condos? Because Jay Maisel, the photographer who bought it 42 years ago for $102,000, still lives there, with his wife, Linda Adam Maisel, and daughter, Amanda. It isn’t a decrepit ruin; 190 Bowery is a six-story, 72-room, 35,000-square-foot (depending on how you measure) single-family home. Real estate agents estimated at the time that the building could go for up to $70 million, nearly 700 times what Maisel originally paid. That was six years ago.